2015 Fender Custom Shop Custom Deluxe Quilted Stratocaster - Honeyburst. Brand new, 100% mint, not been a demo in a store. This Custom Deluxe series has all the upgrades a player would want, without anything over-the-top. This guitar is awesome but doesn't need to rub your face in it kind of look. The Fender Custom Shop has crafted one of its finest Custom Deluxe models yet, using the finest materials available for the player who demands a high-end boutique instrument. 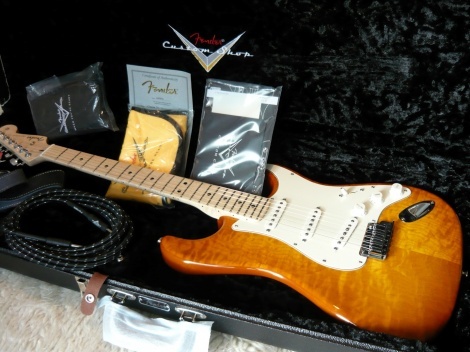 The Custom Deluxe Stratocaster encompasses favourite tonewoods, with a hand-selected alder body beneath the kind of AAA quilt maple top typically reserved for Master Built instruments. This guitar plays & sounds awesome.The fret work is outstanding and so smooth to play. Some features are select Alder body, Gloss urethane finish, AAA quilt maple top with an elegant Gloss finish. AAA figured maple neck w/maple fretboard, 10/56 "V" shape neck, 9.5" neck radius, medium jumbo frets. The three hand-wound '60s-spec pickups include a Fat '60s bridge pickup and a reverse-wound/reverse-polarity middle pickup that produces humbucking "in-between" sounds. Comes with the Fender black tolex custom shop case, hang tag's, paperwork, strap, cord, custom tool kit, polish towel and COA.